Some things are different here in China. A clear day has nothing to do with clouds but, instead, with whether most of the power plants and factories are open today. People’s idea of politeness and decorum is a bit more pushy and phlegm filled. Toilets can be an adventure in balance and bombardier abilities. Not everything’s traumatizing, though. Some things are better. Take McDonald’s for example. If you’ve been reading, you know that they serve dark meat. Did you know that they also serve taro pies, rice, and fried chicken? Did you know that they provide 24-hour delivery and there’s no minimum amount on your order? Feel like a breakfast sandwich after a long night out? No problem. Give them 30 mins and a man hops on a bike and brings it right to your door. Just one of the advantages of population density. 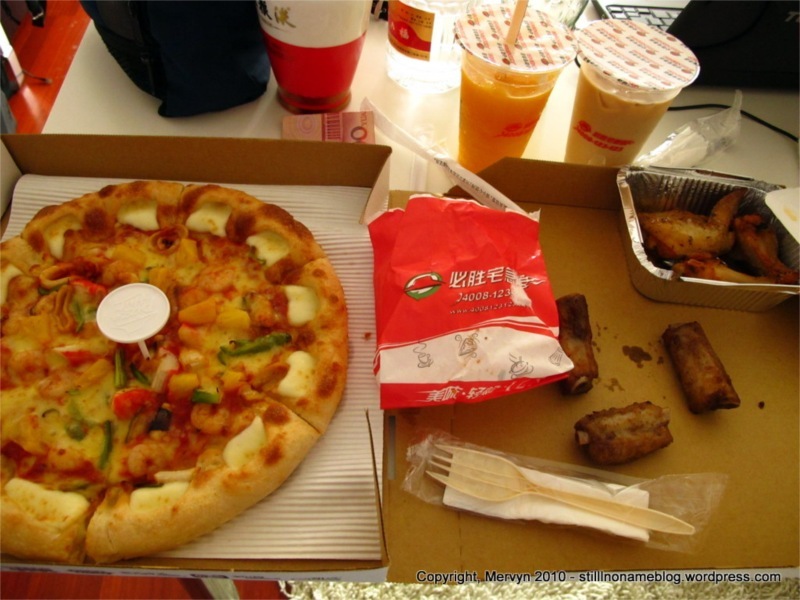 Something else that’s also better in China: Pizza Hut. The greasy pizza maker’s gone legit here and serves human food. Take a look at the menu: rice dishes, tiramisu, ribs, seafood pizza, and even barbecued squid. All available by delivery. You don’t even have to speak Chinese. You can order in English. If you wanted, you could just live in your Western-style apartment with your fancy toilet, wood floors, glass-walled bathroom, order improved fast food directly to your door, and feel like you were back in the U.S. but better. Don’t tempt me. I might try this. I bring this up because, today, Lillian and I had us a whole lotta Pizza Hut. As is her way, Lil ordered two more dishes than necessary. She tried to order more (squid) but failed (English problems) and still somehow scored free stuff (two milk teas). We gorged on seafood pizza, ribs, chicken wings, smoothies, and of course milk tea. All good. All less greasy than one slice of the Hut’s pies back home. So go on China. Do your thing. Take our fast food places and improve on them. Perhaps you’ll be what Japan was for U.S. technology except for dirty, quick food—taking American ideas and improving on them for the betterment of humanity. Maybe someday we’ll see a U.S. Del Taco start to serve fried chicken, rice, deep fried ice cream, and deliver in under 20 minutes. A boy can dream, can’t he? So, I ate. I wrote. But did I make my train? I did. But it was close. I must be making up for a lot of previous good travel luck. I left with plenty of time but forgot that it was a weekday (Monday?) and that 4 p.m. is the start of rush hour. I actually stressed in the cab when he passed the railway station and did a U-turn to get to the entrance. Should I have made him stop across the 12 lane road and just run across the pedestrian overpass? I ran to the gate and to my car, joined by a few frantic Chinese. I did, however, feel comfortable enough with my timing to take 20 seconds to buy a cup of overpriced instant noodles at a stand right before the gate. Still, closer than I’d like. 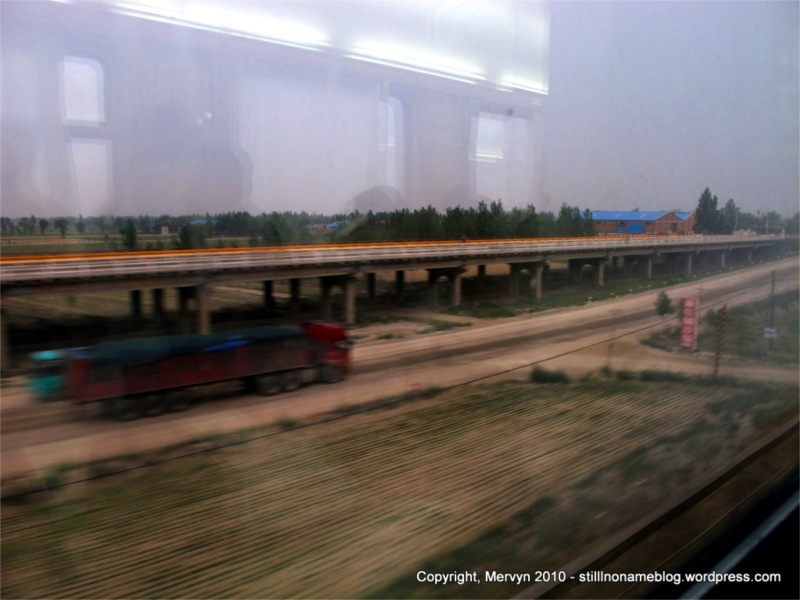 This was my third time on a Chinese train. For the first time, though, I took time to walk around the cars. I found the hard sleeper cars where people sleep on bunks stacked three beds high and don’t have the benefit of a door. The bunks are open to the hall, which has chairs and tables in front of each six-person cubicle. This forces people to be more social. In the soft sleeper cabins, groups can close their doors or cluster around the tables in the four-person cabins. Here, if you want to chat you have to do it at the table in the hall in front of the whole car. People were playing cards on bunks, chatting, letting kids run around. In the midst of the chaos, people slept on bunks, read, or munched on all sorts of snacks. 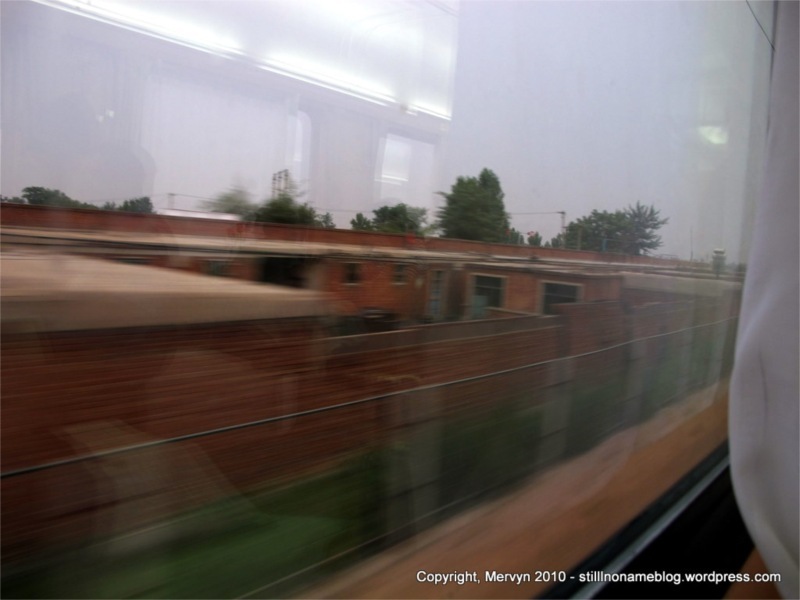 It felt like typical Asian street life, all bottled and concentrated in train cars. There were so many hard sleeper cars I got tired of crawling over people and turned back. I never found the hard seat cars (no bed, airline type seats). At the other end, I found a soft sleeper car that seemed geared towards families. Lots of kids and moms running around. 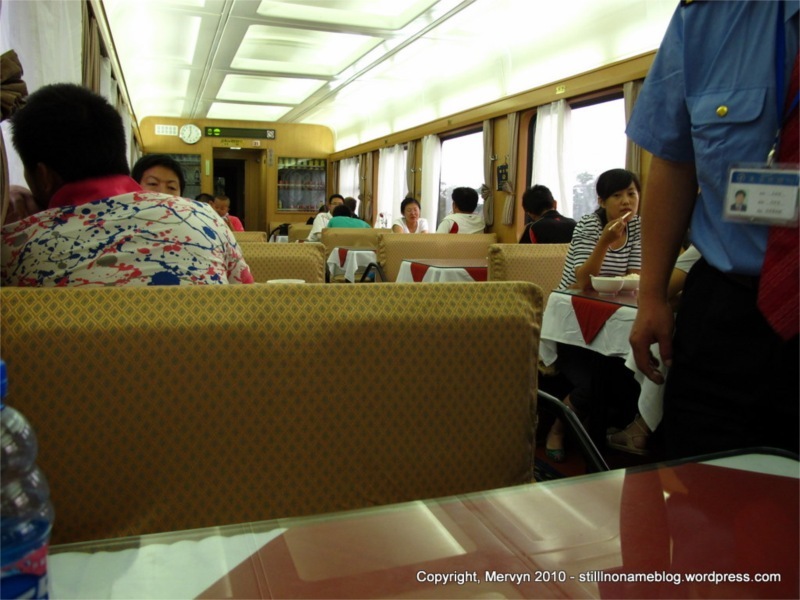 After that, the dining car where I decided to try the food. Egg and ham and a bowl of rice for 18 rmb ($2.60), a highway robbery price. It was quick, though, and I got to sit around and watch people eat and drink. There are limited seats so eventually a gentleman joined me at my table. I sat politely for a minute, then bailed. From there, a deep sleep night to Xian. Not bad. Perhaps next time I’ll take a hard sleeper car. I have a feeling it might be an interesting experience, which could mean everything from meeting a nice old lady who thinks I look like her son to being murdered in my sleep. If nothing else, it’ll be cheaper. GALLERY: Nothing extra today. Come back tomorrow. There should be some Terra Cotta Warriors.